The Winner of the April Pet Photo Contest is..
Congratulations Lowrider! 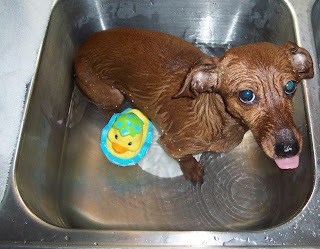 You are so cute sticking out your tongue, soaking wet with your little ducky by your side! Your photo will be PetsJubilee team store avatar for the month of May. Lowrider has won a free PetsJubilee Pet Sampler box full of goodies, samples, accessories and treats. Their mom runs Westerncritters on Etsy, a great shop which specializes in custom sweaters, dresses and hats for the pampered pet. She also has a second shop, Shortendofthestick which is full of unique dog charms, collars and accesories. Please stop by these two shops for some great pet apparel. "Mia was pretty grumpy after Daddy squirted her with the hose! Here she is pouting on the porch :) "
"HELP get me the hell out of here!!!" 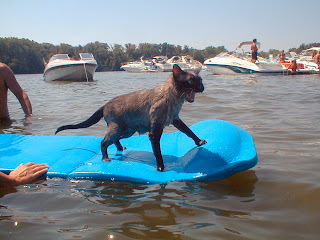 "Nimshai loves the beach, but doesn't think much of the water. I finally convinced him to come into the surf!" "Look!! Look!! I can swim! I'm so excited...maybe I'll go for the Guinea Pig Super Star Olympics...maybe I'll get a lead role in the next Madagascar movie...maybe...OOPS! Sorry about that..a little too much excitement and look what happens..a little floaty....how embarrassing." "Hi! 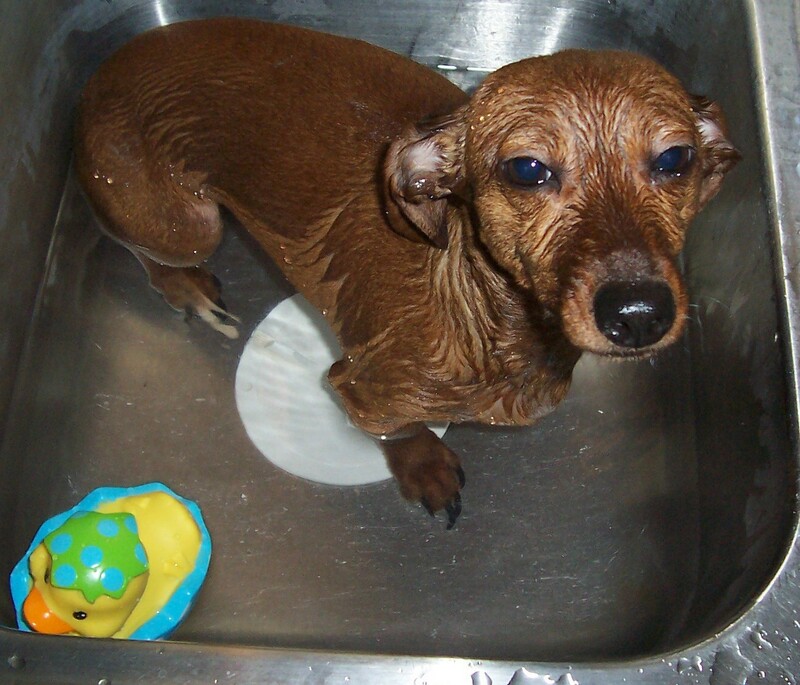 I am Lowrider and I may be little but I have a full size wiener attitude and I have no bones about telling anyone how I feel about my bath! (As you can see in my picture.) This bath cost my mom a cheese head cheese stick, yes I take bribes! and if all fails I plead...no,no,please don't do this, not the bath thing! no......not the duck! " "This is Jewel. She is a 1 year old Chihuahua and not quite 3 pounds." "After swimming around as the dreadful "PAWS," Molly looks very punk rock!" "Well, this is me (Molly) and Big Mac in the pool...Mom wanted to submit a video of us swimming and riding on the floats but she talked all the way through it so she went with this instead.....Big Mac, he likes to swim...Me? I swim if I have to, and if I have to, I'm holding onto something...even if it's Big Mac's lip!? Hey, what are big brother's for, right?" April Pet Photo Contest: "April Showers"
Nearly everyone had a very difficult and snowy winter and I know we're all thrilled for Spring to finally be here! In keeping with this very "springy" month, our theme is "April Showers". 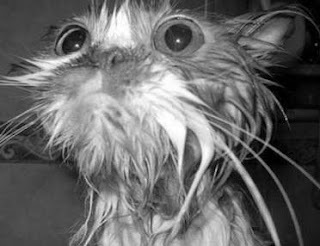 Show us your furbaby all wet, in the water, or with a watery background. We'll also accept photos with a spring or Easter theme. Send in your photo, slide show, or video of your wet pet. Add some words to be posted with their pic to go along with the theme. We'll accepting entries from April 1st through the 18th. Visit us in the forums where we'll be hanging out and introducing the new entries until voting begins on the 19th.